I love this simple statement Luke includes when he recounts the trial of Paul in Acts 22. Paul had been preaching the gospel, sharing his story of encountering Jesus, and it caused a stir. People were upset. They couldn’t handle what he was talking about. 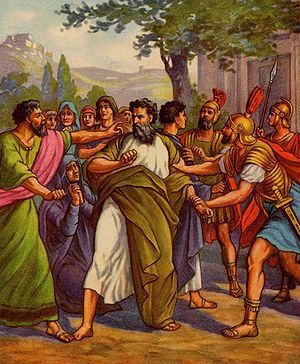 And their reaction was to hand Paul over to the authorities. The Romans did what they were trained to do – get the truth out of Paul any way that they could. Their interrogation methods included flogging. Nothing like a few lashings to get to the truth. But before they made it that far down the particular path, Paul explains that what they are about to do us unlawful, for although Paul is a Jew, he was also a Roman citizen by birth, and thus he had some legal protection from being bound and interrogated without cause. What strikes me about this story though is not Paul’s social and political savvy, or even his practice of what some have labeled “riot evangelism.” (Not arguing against this either. The demonstration and proclamation of the Gospel should cause a stir!). No, what I find fascinating is that the Roman tribune came to back to Paul, “desiring to know the real reason why he was being accused by the Jews.” (v. 30). Do our lives and our words have that kind of effect? Not just the effect of causing a stir or a controversy. Not just the kind that instigates a riot. Not just the kind that shakes the comfortable and complacent out of their apathy. The real reason for the hope that we profess. The real reason for our experience of God. The real reason why some would struggle to the point of wanting to condemn, ostracize and even punish us for what we believe, what we proclaim and what we demonstrate with out lives. That’s the kind of impact I want to have. To see men and women and children be so moved with desire to want to know the real reason why I believe the gospel. This is why I’m excited to see more interest being taken up in the realm of “gospel neighboring” and if you haven’t yet stumbled upon Andy Stager’s blog and podcast on this subject, you really should go check it out here. It’s when we live with such radical hospitality, in close proximity to others in our communities, that the distinctiveness of our lives shaped by the Gospel will begin to have the effect of disrupting the perceptions and preconceived notions of Christianity and Christians themselves, and that space for desiring to know the real reason is created – in relationship. Can you imagine what would happen if our words and lives had this as their aim and intention? ….so-and-so seems out to get you? ….you’re not holding that grudge against that guy who threw you under the bus? ….you’re not falling apart when your husband lost his job? ….you’re neither a fundamentalist, prude, nor are you a anything-goes kind of person? ….you love your kids and yet your world doesn’t simply orbit around them and their schedules? ….you’re life has changed so dramatically? ….you go to that church? Can you imagine the folks in your particular sphere of influence asking you these kinds of questions? That’s the kind of person I want to be, and the kind of people God wants us to be as we seek to live a distinctively Christian life in the world He has placed us.